Having seemingly turned a corner these last few weeks, Kildare reached for reverse gear in Celtic Park. For sure there were plenty of positives and the temptation many of us succumbed to in the immediate frustrating aftermath was to blame the officials. More of that later. This had more in common with Tyrone in 2014 and Down in 2015 than Cork in 2017 as another Ulster county caught Kildare at the death to swipe league points from under our noses. The 73rd minute goal poached by Emmet McGuckin was shrouded in controversy but it is hard to argue that Kildare deserved much more from a game they twice appeared to have under their control. What of the positives? Well, Kevin Feely was again composed and influential in midfield, Fergal Conway worked like a trojan as ever, Niall Kelly took the game by the scruff of the neck when it was in the melting pot and Kildare were struggling for forward momentum. And Neil Flynn mixed superior endeavour with a sense of adventure up front that directly yielded a goal for young Chris Healy on his first competitive start. Ultimately though you were left with a feeling of regression. Defensively there wasn’t enough of the cussedness that wrapped Cork up in a knot two weeks ago in Newbridge. There was a complete fade out before and immediately after half-time when we were poised it seemed to put our foot on the throat of a Derry side lacking in confidence and direction after a blitzkrieg from the visitors between the 16th and 20th minutes. Let’s get the injury time disaster out of the way early. Kildare had recovered their verve after Derry’s third quarter onslaught and reeled off four points in row against the wind to seemingly copper-fasten their third win on the trot. When Derry’s magnificent man-of-the-match James Kielt ran out of room and energy and kicked weakly wide from close range on 70 minutes Kildare looked set to hold out. Cue the ghosts of Ulster opposition past. Kildare fumbled in midfield and substitute Ryan Bell sent a hopeful long high ball dropping in under Mark Donnellan’s crossbar as a last throw of the dice with McGuckin loitering close by. The Derryman met Donnellan as he landed and pushed the ball out of his hands and into the net. Your first thought was square ball. Your second was foul on the keeper. Tyrone referee Sean Hurson emphatically appeared to agree that the goal was illegitimate and clearly indicated a free out in the same expressive manner he had used all day. Phew! But in keeping with Kildare’s recent (and historical) luck with officials, the Ulsterman decided to consult his colleagues behind the goal and you just knew what was coming next. Green flag raised and as soon as Donnellan took the kick out, Hurson whistled for full time. Ulster ref for an Ulster team at home – the GAA really don’t do themselves any favours sometimes. Kildare though can have few complaints. They were never fully at the races here and perhaps a draw was the most their ragged performance deserved. Dealt a significant blow with the absence of in-form forwards Paul Cribbin and Ben McCormack, the subsequent re-shuffle ironically seemed to de-stabilise the defence more than the attack. The management team might want to consider whether the absence of two forwards warranted disrupting four different lines on a team that had done so well in the first two games. Chris Healy came in for McCormack at corner forward and was not found wanting but it was the absence of the younger Cribbin brother that was critical. His brother Keith moved forward from 7. to 12. to replace him and Peter Kelly came into corner back pushing Mick O’Grady to right half back and Jonathan Byrne to left half back. 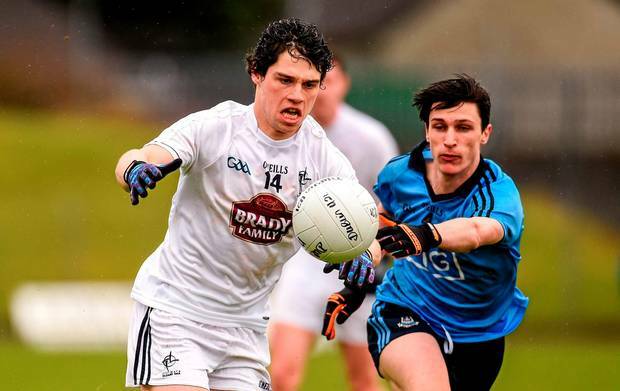 Whatever the reasons, Kildare’s defence never got to grips with a Derry attack that was more lively than their early season results might have threatened. The inside line were behind their man for most of the game, were turned too often and the team as a whole were back to giving away frees too easily which Kielt in particular was delighted to punish. Many of the frees were unnecessarily conceded and it is sign of naivety that we don’t seem to realise from early on when a referee is likely to punish the most delicate of physical contact. I thought they bred them tougher in the North. Further out the field, there seemed to be gaping holes filled primarily by marauding Derrymen where one might have hoped a green-clad defensive line would have been situated. It could have been Kerry 2015 or Dublin 2013/14 all over again. That was possibly the biggest disappointment of all today, try as Eoin Doyle did to plug the gap. Kildare did put some fine attacking moves together, particularly in the first-half with the wind. It became more laboured after the break but eventually they found their feet and with Kelly prompting skillfully from no.11 there was a maturity about the way they seemed to be closing out the game until injury time disaster struck. The game opened at helter-skelter pace and didn’t really let up for 25 minutes. When you come to Celtic Park you expect a dogged affair particularly on a pitch as heavy as today. But Derry were as forgiving as the visitors defensively and a shoot-out quickly developed. Both sides had reeled off 0-5 within the first 12 minutes with Daniel Flynn (2) the two midfielders Moolick and Feely and Neil Flynn from a free getting off the mark for Kildare. Derry’s scores were spread among Kielt (2), his midfield colleague Conor McAtamney and captain Enda Lynn. Kildare could have made further headway when Neil Flynn got in on goal but Conor McLarnon denied him with a fine save. Conway ended a run of three games without a score with a hard-earned point before Kielt responded with a free, but Kildare then went into overdrive with a purple patch. The goal that put them into the driving seat was encouragingly created out of nothing by youngsters Neil Flynn and Healy. The curly-mopped Two Mile House youngster won a free in front of goal. Flynn then did something very un-Kildare-like in my experience and instead of tapping over a point noticed his colleague in space. His quick-thinking set up Healy to side step McLarnon and emphatically finish to the roof of the net. That cleverness seemed to inspire the players around them and Kelly, Byrne and Cribbin reeled off three points in a matter of minutes to put the squeeze on the home team. Kielt and Flynn traded frees and the dangerous Carlus McWilliams closed the gap to five points with eleven minutes remaining in the half, but you felt Kildare now had an opportunity to put the foot down and put the game beyond a reeling Derry. No such thing though. Neither side managed another score before the break as they seemed to collectively collapse from exhaustion. Derry could have ended the half with a huge boost though when a long injury-time ball from Kielt threatened to deceive Donnellan but Hyland helped him to clear for a ’45. Speculation at half-time surrounded the extent of the wind advantage Derry would enjoy in the second half. Whatever it was, it certainly wasn’t seven points! But that’s what the Oakleafers reeled off in a devastating burst that visibly knocked the wind out of Kildare sails. When they needed to kick on after falling asleep before half-time they instead dropped into a seemingly terminal sleep. Kielt was magnificent in that devastating 10 minute spell, adding four more points to his name, two from long range bazookas and two from frees. The screams of the away supporters to “get on his ****ing toe” were ignored as the big man seemed to have endless time to size up the familiar Celtic Park goalposts. Derry were sucking diesel with a two point lead and Kildare were struggling for air. Neil Flynn did stop the rot with Kildare’s first point in 21 minutes though and when Kelly put the head down and wouldn’t take no for an answer when shooting the men in green level two minutes later. McWilliams though burst through for another for the home side which Neil Flynn soon cancelled out. Nip and tuck at this stage. Unfortunately Kildare went into their shell again as Derry upped the energy levels. Donnellan made one of those blocks that are becoming a trade mark but Kielt and McGuckin pushed the Ulstermen two points clear again with an hour on the clock. Captain Doyle burst up the left wing but sent a low rasping shot wide of the right hand post as Kildare went through another 12 minute scoreless spell and Derry looked likely winners with 10 minutes left. But credit the young away side as they wrestled the initiative back. Time will tell whether the four points without reply against the wind in those final 10 minutes is more indicative of their current maturity level than the aberration, costly as it was, in injury time. Daniel Flynn remains a conundrum for Cian O’Neill to work out and deploy optimally. He mixes frightening pace and ballooning scores with an apparent struggle to fulfil the basics of soloing and handling the ball while moving at the speed his legs afford him. But you can’t argue too much with a three point return and his final score here got Kildare’s apparently match-winning salvo off the ground on 63 minutes. Athy’s Kelly couldn’t offer much more of a contrast with Flynn. Every movement seems calculated and his close control affords him that extra yard of space that the game’s best forwards enjoy. With four minutes remaining he pushed Kildare level. That came however after Neil Flynn had missed what appeared a relatively straightforward free from 30 yards in front of the posts. Against the wind it may have been but despite his fine performance, realistically that miss contributed to Kildare missing out on the draw. To be fair to the Maynooth lad, he shrugged off that miss with two minutes left, showing bravely for the ball and shooting his fifth point of the game to put Kildare ahead. When Conway burst through on the right a minute later and sensibly fisted a point from a narrow angle, victory was in sight, albeit with blurred vision. Kildare have still not won a League game on Derry soil in 10 attempts (1 Draw, 9 Losses). We remain second in the table though and a strong points difference keeps us well in the promotion hunt after 3 games but the table has a squashed look after this week-end’s games and Sunday’s home tie with Fermanagh with have a huge bearing on whether we spend the remainder of the campaign looking upwards or over our shoulder. Post-script: I am reliably informed by @CillDara Times that this was our sixth successive defeat wearing that resplendent green jersey. Kildare Line-Up: Mark Donnellan; Peter Kelly, David Hyland, Ollie Lyons; Mick O’Grady, Eoin Doyle, Johnny Byrne; Kevin Feely, Tommy Moolick; Fergal Conway, Niall Kelly, Keith Cribbin; Chris Healy, Daniel Flynn, Neil Flynn. Subs: Cathal McNally (for Cribbin 45), Eamon Callaghan (for Healy 57), Shea Ryan (for Byrne B/C 60), Fionn Dowling (for Moolick 60), Conor Hartley (for N Flynn 70).